New BPE Boss Pledges to Ensure that Privatized Enterprises Give Services to Nig. The new Director-General of the Bureau of Public Enterprises (BPE), Mr. Alex Okoh, formally took over the reins of authority at the Bureau in Abuja on Friday, April 21, 2017 with a pledge to ensure that privatized enterprises in the country give services to the generality of Nigerians. At a brief ceremony attended by the management team of the Bureau in the Director-General’s Conference Room, the BPE’s new helmsman said what was required of everybody was dedication to duty to achieve the desired goal. He said his administration would also work to sustain the positive image of the Bureau while at the same time strive to change the negative perception held by some people about the BPE in the execution of its mandate. Okoh promised to step up the post-privatization monitoring activities of the Bureau to ensure that owners of privatized enterprises live up to the covenants they signed with the Bureau so that Nigerians could derive maximum benefits from the privatized enterprises. He thanked the former acting Director-General of the Bureau, Dr. Vincent Onome Akpotaire, for successfully piloting the affairs of the Bureau in the last 14 months and called for synergy during the transition period. 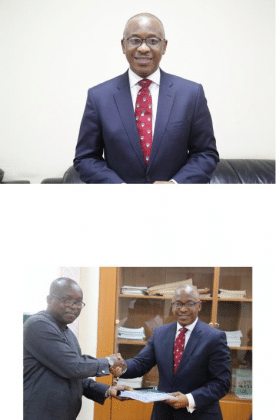 Earlier, Dr. Vincent Onome Akpotaire while handing over to the new DG said that given his background as a seasoned administrator, the management and staff of the Bureau are confident that he would succeed in his new assignment and give the Bureau a new lease of life. On their part, members of the Management Team pledged to co-operate with the new DG to take the Bureau to greater heights. He was later conducted round the offices where he familiarized with the staff. Before his appointment by the Federal Government on Thursday, April 13, 2017 as the Director-General of the Bureau of Public Enterprises (BPE), Okoh was the Managing Partner of Ashford & McGuire Consulting Ltd. The DG, who is currently a member of the Presidential Economic Advisory Council, has 32 years experience, of which 22 were in the banking industry where his responsibilities involved general management, leadership and organizational development. In his banking career, he functioned in a variety of roles including corporate banking, operations and treasury, often leading projects and initiating and designing processes. He was the Managing Director/CEO of NNB International Bank Plc from 2001 to 2006 where his visionary leadership took the bank from a comatose state to a position of enhanced value for stakeholders. Okoh has ten years in Management Consultancy, having functioned as the Managing Partner of Ashford & McGuire Consulting Ltd, a top wholly indigenous consulting firm. The BPE new helmsman is a graduate of Harvard Business School’s Advanced Management Program and has acquired international working exposure through programs with Citibank New York, Fidelity Bank London, Swiss Banking Corporation, Zurich and Grindlays Bank, Zimbabwe. His former employers include Nigeria International Bank Limited (Citibank) and United Bank for Africa Plc. He studied Sociology at the University of Benin and holds a Master’s degree in Banking & Finance from the University of Ibadan. Okoh is an alumnus of the Harvard Business School.